The late E. Talbot Donaldson repeatedly commented on the lack of due recognition of Chaucerian elements in Shakespeare. His lively study, The Swan at the Well. 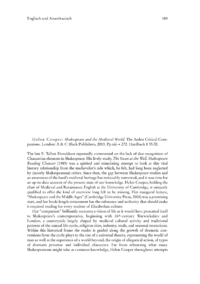 Shakespeare Reading Chaucer (1985) was a spirited and stimulating attempt to look at this vital literary relationship from the medievalists side which, he felt, had long been neglected by (mostly Shakespearean) critics.